Connecting with the audience and keeping things simple is how Neha, a Food Blogger, creates her content. Read through her interview for more tangy savours. Glance through the trek of being an introvert person to a confident social media influencer. I posted my home cooked food and that got tremendous love from everyone. That’s what made me fall in love with instagramming even more and gradually that love turned into passion. Moreover it has drastically changed me from being a introvert person to a confident social media influencer. I love my name neha and I am a big foodie. I created this page to share my love for life especially food with others .That is why ifoodieneha4you. Never thought of using hatke names but yes this name is special . I think my simplicity would be MY USP.. I create posts that one can easily feel connected with . 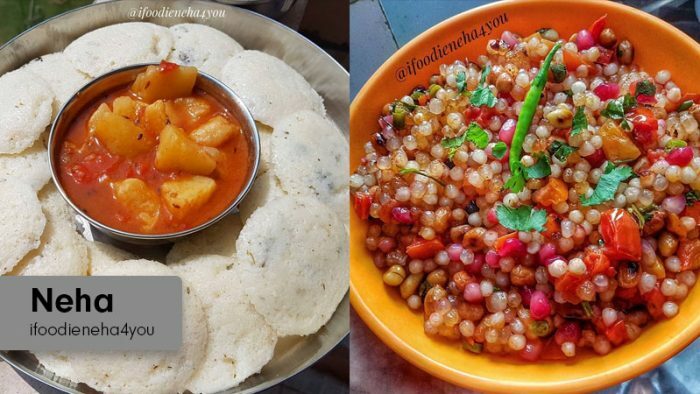 Keeping things simple and connecting with audience and posting what they want to see is what makes my content go viral .Home food, recipes, street food, engaging stories ,videos and my unbiased reviews for the places I visit. I Never work for free – be it collaborations, barter or any promotion. Brands contact us after seeing our good content . We put in so much efforts to create quality content. Influencer marketing has set really good budgets. In short your work speaks .They will definitely pay you if you are good at it. I followed this and this has helped me alot . I try to be as genuine possible .Rest depends on the category of brand . One day I was at Chaayos & it’s social manager was talking to a group of food bloggers about instagram profiles and influencers . I heard my name .She was telling them that they love my page. They simply love how i express my love for everything I post . Then one of them pointed ” she is the one you are talking about.” My face was all red .It was a proud moment . I was overwhelmed with the love, appreciation & respect i got that day. That was special . Also when people send me messages like they love me and they want to learn things from me or I inspire them makes every moment special . Nothing as such except when brands asks to do it for free and compares you with other pages. I’ve done my graduation and diploma in maas media & film and tv production. If not blogging , I would be having my own studio and production house or my own cafe that to with some fancy theme .That’s a dream project actually. Wake Up, face time with my family, reply back to all the mails , get ready to go to office , attend events or food reviews and coming back home , cooking for myself , some me time , diary writing. Pre Planning for next day .A busy but happy life . In between all these things one person who is always there for me is my partner Sachin. He encouraged me to do whatever I want to . He is my biggest strength . This page is not just about me it’s about us . He just don’t want to come in limelight. We together working day and night & we absolutely love it . When we are together things become easier . We strongly believe people who eat together works, always stays together, and be the best partners for life . If you are passionate about doing it- then only do it. Don’t do it because others are doing it. Create your own style, be original and consistent , give the best of your best and nothing can ever come in your way to be successful. Each and every influencer is inspiring. MYHAPPINESZ -She is love. So much to learn from her. ZINGYZEST- She is so hardworking and helpful. DELHI_EATS – She is full of life. She gives those happy and positive vibes. There is so much to learn and long way to go .I want to explore regional cuisines of India not just by seeing the videos on internet rather visiting the places to learn everything .Learning from localities has its own charm .They know the secrets , stories and authenticity of everything . Near future I would definitely create interesting and creative content . Also, I would like see my name in the top list of genuine influencers of the country. Long way to go but I know I will do it.